Team Colibri: What is the difference between HDS Gen 3 and HDS Carbon? Whenever a completely new model or a rewamp of an existing model comes out, we get the same question: "What is the difference?" 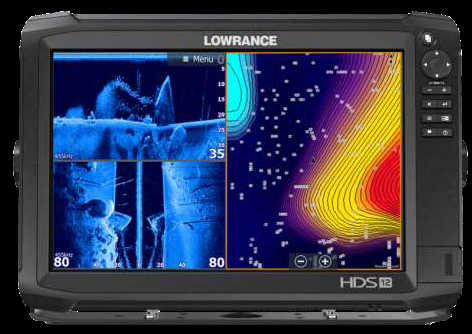 What is the difference between Lowrance HDS and Lowrance Elite HDI? What is the difference between Lowrance HDS Gen 2 and HDS Gen 3? This time we will take a look at the difference between Lowrance HDS Gen 3 and the brand new Lowrance HDS Carbon that was released 15. december 2016. We will look at the technical stuff, and try to translate that into what it will mean when out on the water. HDS Carbon is actually the fifth version of the popular HDS-series. Before it came HDS Gen 1, HDS Gen 2, HDS Gen 2 Touch and HDS Gen 3. HDS Gen 2 Touch marked a new area of how Lowrance run their model-updates, since it was released shortly after HDS Gen 2 and the two lived alongside eachother for a year before HDS Gen 3 came. Again HDS Gen 2 Touch was keept alive alongside HDS Gen 3, and we will now probably see this pattern repeated with HDS Gen 3 living on for another year or so alongside HDS Carbon. Life goes on. Better screen-resolution in 7 and 9. Better screen on all sizes. Resolution, not only a question of your screen. Did you know that the resolution in your sonar-signal is a lot better then the resolution of the screen you use to view that signal? The devil is in the detail, and the fish are to be found with good resolution. Sure, if you are fishing for 50LBS fish in 20 feet of water, just about any sonar will show you that fish as long as your boat (or rather your transeducer) is placed over it. But when it comes to seeing small targets, single baitfish or larger fish at greater depths, resolution plays a big part. When talking about resolution and sonar, we are really talking about two things: target-seperation and screen-resolution. The sonar-signal itself has limited resolution, but those limits have been pushed. This is a huge subject, but to put it in laymans terms; having a great resolution screen will not help you one bit if the sonar itself has poor target-seperation. Over the last few years we have seen MASSIVE improvements in target-seperation in recreational sonar, in many ways that trend started with HDS Gen 1 and has since evolved and spread, but made a sudden leap when chirp entered the game. Todays chirp-sonar, and especially when paired with a low-Q transeducer like Airmars chirp-ducers are way better then that HDS Gen 1. Even with the more conventional (and wallet-friendly) Lowrance OEM-ducers like HST-WSBL there is noticable difference, both in shallow and deep water. With the introduction of double band chirp on HDS Carbon, that target seperation is taken one step further from HDS Gen 3, as long as there is a double band chirp-ducer from Airmar in the equation (and budget). For the shallow-water guys fishing for bass or northern pike etc there is litle to gain from double band chirp. But for those fishing in depths greater then 300 feet, and for those that fish both shallow and deep depending on what they are fishing for, the difference is noticable. There is a price to pay though. Right now the only transeducers that allow us to draw from this double band chirp are from Airmar and they are pricey. Ducers like TM265 and TM275 are great tools, but will easily cost the same as your HDS. I`m personally a huge fan of getting the biggeste screen with the best resolution you can afford. For this reason I have always avoided the 9 and actually stuck with HDS 8 Gen 2 as my main screen on my own boat. The table above clearly shows that the days of my HDS 8 are numbered. Both Garmin and Humminbird have been ahead on screen-resolution on some models for a while, but that ends with HDS Carbon. If you are in the market for a 7-9, that fact should make HDS Carbon a serious contender. Screen-resolution is important when out on the water. Downscan, SideScan and 2D-chirp allows our sonar to seperate targets better then ever before, and now the screens we look at have finally stepped up as well. It will be easier to spot fish hugging bottom or structure, and fish hiding in cover like brushpiles etc. On forums and Facebook I see people complaining about how the screen of their sonar has such low resolution compared to smartphones or tablets at a fraction of the price. There are two reasons to consider here. The first is that your phone or tablet does not have to meet the same requirements as your multi function display (MFD) in the boat. Your MFD has a harsh life, exposed to extreme temperatures and water. Components meeting such requirements cost more then the ones in your phone. The other reason is the distance between your MFD and your eyes, versus the distance between your phone and your eyes. The further the distance is, the less gain comes from good resolution. So there is no reason for our MFDs to compete with our phones and we should stop comparing products that are ment for such different use. You don't see many people comparing phones with electronic boards at trainstations and airports, because there is no reason behind such a comparison. Whether or not the new screen-resolution of HDS Carbon 7 and 9 is where the limit should be drawn is another question. Personaly I would say no. 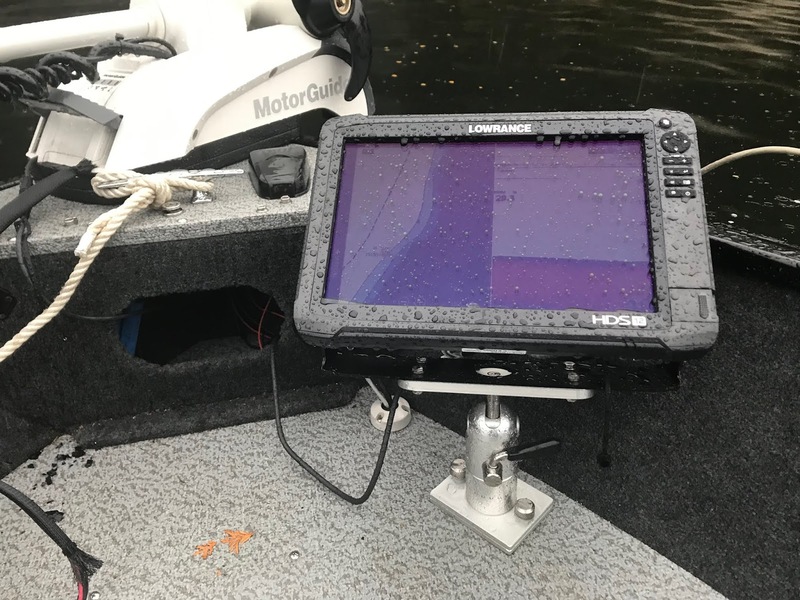 With HDS Gen 3 Lowrance made the jump from LCD-screens where plastic was glued to plastic, and on to plastic glued to glass. The difference was noticable, especially in bright sunlight, but they where still using TFT. With the improwed IPS-standard screen on HDS Carbon the screen itself improves again from the TFT on HDS Gen 3. The visible light coming from the screen is brighter and easier to view in direct sunlight, but viewing-angles are also improved. Especially for users preferring the white background in their 2D-sonarimage, the white is now significantly whiter. IPS is pretty much the same standard as used in you flatscreen-TV back home. 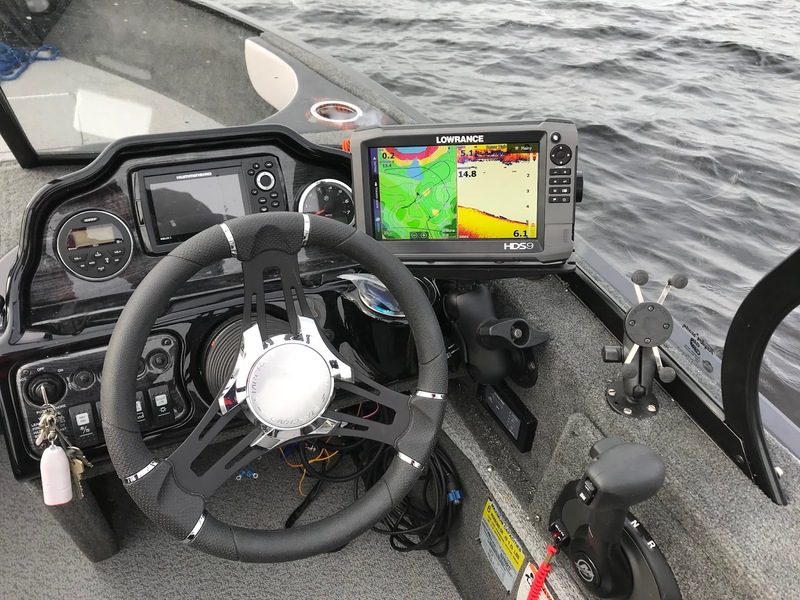 With IPS it is easier to view the screen as you run around in your boat, trying to catch fish, while glimpsing over to your HDS to see if you are missing something. This is a good thing, bassboat/single-consolle or cabin-boat alike. IPS also helps another issue. Polarized sunglasses are very populare amongst boaters and fishermen, both for the extra comfort when reflections from the water are removed/ dampened and for a better view of what is under the surface. But they usually had to come off when looking at your sonar and chartplotter, since the screen would look dark through the polarized lens. IPS makes a big difference there, you can keep those shades on all the time now. Dual core processor and twice the RAM versus HDS Gen 3. If all you have ever used your HDS Gen 3 for is 2D-sonar and charts, you have probably never noticed any delay or temporrary freeze. But if you have a more complicated system including AIS, radar and StructureScan 3D, the occasional delay has been there even with HDS Gen 3 when running everything at the same time in splitt-screen. Especially StructureScan 3D seems to be heavy lifting for the HDS, but with HDS Carbon that is improved. With live-mapping coming, both Navionics Sonarcharts Live and a second solution, the load on the unit increases. We have seen this before in other brands, both Humminbird and Garmin stepped up their units capabilities after their first generation of units with live-mapping. 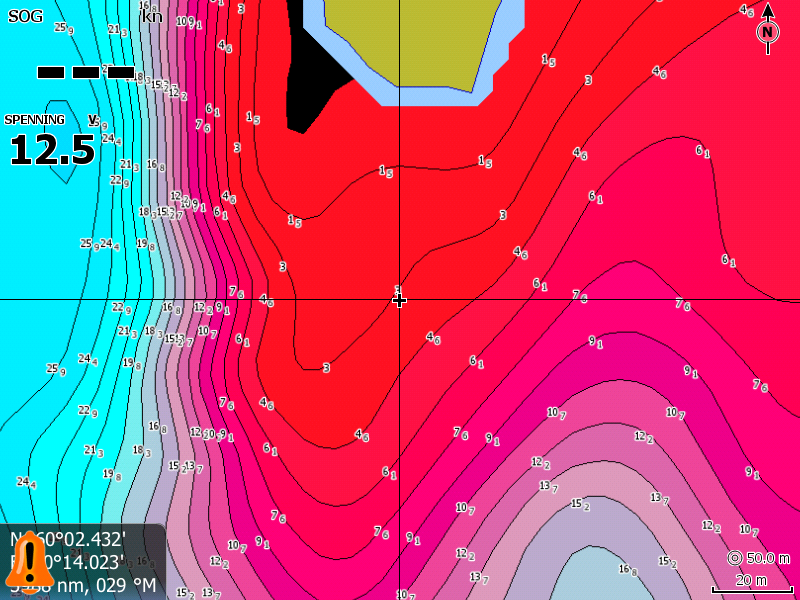 The process used to make those contours on your screen is called interpolation, and even if the type of interpolation used in live-mapping is fairly simple, it is to be considered as "heavy lifting" for any chartplotter. 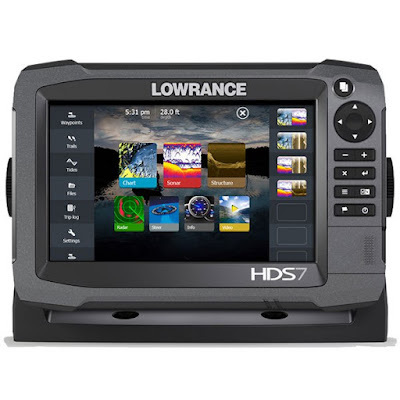 Although it is not completely clear at the time writing this, it seems obvious that the increased capabilities of HDS Carbon is connected to Navicos (owner of Lowrance) efforts in cloud-based services. The trend towards the cloud has been evident in all other aspects of our electronic lives, and it is making its way onto our boats as well. We have already been able to update our units software through the cloud (this specific cloud is GoFree Store), upload sonarlogs and download charts. But there is a lot more to come in this field. 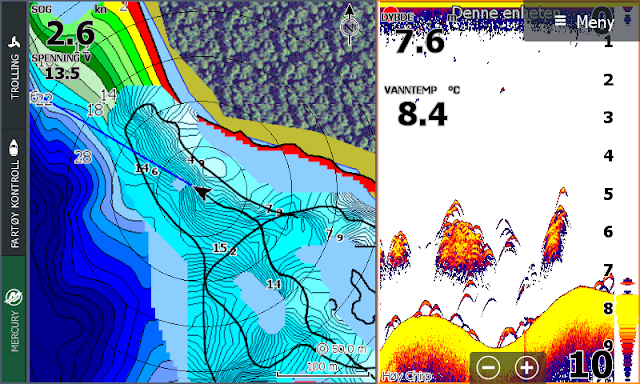 Lowrance has had network sonar for quite some time, even before the HDS-series came to light. Any source for sonar can be viewed on any HDS, as long as that HDS is connected with ethernet (grey cable with yellow connectors) to the HDS in which the ducer one wishes to view is plugged. A practical example is your average bassboat. It has one HDS at the drivers seat, and another up front by the electric trolling motor (TM). The boat has one ducer at the back, and one under the TM. By changing the source for sonar in the menus of any of the HDS-units onboard, one can view both those ducers signal. Another practical example is my own boat, it does not mather if I use the HDS on the aft deck or in the cabin, both use the same ducer through ethernet. With HDS Carbon the network sonars capabality is doubled. You can now view two sources for 2D-sonar on one HDS in splittscreen. So in our bassboat-example you can stand up front by the TM and see both what is under the TM, and what is under the transom. This is great news when fishing in shallow and rocky areas, but also for tracing fish that moves around from one end of the boat to the other when fishing vertically or dropshooting. That is litterally the thousand dollar question. The main problem for me when asked this, is that the correct answer for you is based on 10% tech (which I frankly know well) and 90 % subjective reasons (which I'm clueless to). I would probably not upgrade from HDS Gen 3 to HDS Carbon, but I will upgrade one of my HDS Gen 2s to HDS Carbon. We now know that the multiple source-2D will not work when older models then HDS Gen 3 and HDS Carbon are on the network. So if you have a HDS Gen 2 or HDS Gen 2 Touch connected with ethernet to the Carbon, it vil use "legacy mode". Ie no double 2D in splittscreen, but still network sonar where 2D from one HDS can be viewed on all other HDS-units on the network. With software 18.2 for HDS Gen 3 and Carbon, it is no longer possible to run these in ethernet-network with older HDS-units like Gen 2 and Gen 2 Touch without issues like lagging sonar and other buggs. So as of now HDS Gen 3 is "the oldest new" unit that networks well with the newest units HDS Carbon and HDS Live. On the bright side Genesis Live is a great tool for both Gen 3 and Carbon. Well written article.. Thank you for sharing. For us folks that don't keep up with all the tech details, this gets it across very well. I'm interested in your ending comment on the fact that you will upgrade one of your Gen 2's. I have two Gen 2's. If I update one, what capability will I have on the other Gen 2 if I upgrade to 3D, Carbon on the other. Will the Gen 2 be able to still utilize the new structure scan and transducer? Apart from the 3D-image of StructureScan 3D, everything else can be shared from a Carbon to your Gen 2. Sidescan and downscan from the StructureScan 3D-module will work on your Gen 2, whilte the 3D-view will only be on the Carbon. You can offcourse also use the network-sonar to view 2D-chirp from the Carbon on your Gen 2. (I have StructureScan 3D in my boat and use its sidescan/ downscan on my Gen 2s all the time.) In short, the answer to your question is yes. Thank you. This is very helpful. Learning more all the time. Interestingly enough, with my Gen 2 Touches I'm still using the original LSS-1. I was told early on that this is a better device than the newer model, but had to be changed due to patent violations. Is it better to upgrade this to get better functionality out of what I have, even if I don't upgrade to Carbon/3 and 3D? I see no difference in image-quality from LSS-1 to LSS-2.The LSS-1 is smaller then LSS-2 so it is easier to place in a good way on the boat. As you say Lowrance changed the design from LSS-1 to LSS-2 due to a lawsuit. I still use LSS-1 on my small boat (and Structurescan 3D on my larger boat). So no, I would not change a functioning LSS-1 to LSS-2. But you can use downscan/sidescan from Structurescan 3D on you HDS Gen 2 Touch. ;) You will not se the 3D-picture though. HDS Carbon and HDS Gen 3,have the same output power, 500rms? yes they have the same output-power. It is not fixed to 500rms though, the manual is a bit misleading there and referring to the RMS when used with Lowrance-transducers. The actual output varies depending on the type of transducer you connect to the HDS and the depth you are in. It will go from just a few watts to close to 1000watts RMS (not peak) depending on transducer and depth.